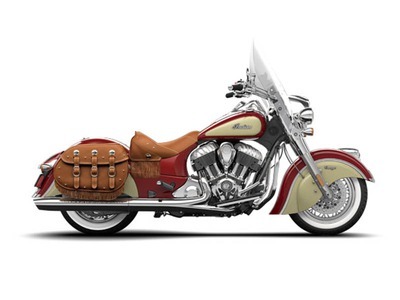 2015 Indian Chief Vintage Indian Red / Ivory Cream, 2015 Indian® Chief® Vintage Indian Red/Ivory Cream STYLE MEETS SWAGGER. The 2015 Indian® Chief® Vintage brings iconic Indian styling to a whole new level. Standard Features May Include: THUNDER STROKE 111 The Thunder Stroke® 111 engine delivers an incredible 119 ft-lbs of torque and features styling that pays tribute to legendary Indian Motorcycle® engines of the past. KEYLESS IGNITION Enjoy keyless starting that s secure and convenient. With the Indian® Chief® Classic key fob in your pocket, climb on the bike, push a button and ride. If you misplace the fob, use the individual security code that you pre-programmed into the ignition. TRUE DUAL EXHAUST The engine produces a rich exhaust note from the true dual exhaust. The exhaust was acoustically engineered to eliminate high-pitched sounds, so what you really hear is Indian Motorcycle® thunder. INDIAN MOTORCYCLE® BADGING One of the classic elements of an Indian Motorcycle® is the vintage badging. Ever since the Indian® script logo was first created in 1910, this feature has made the Indian Motorcycle® badging a hallmark of this historic brand. WAR BONNET Lighting the way as it has done since 1947 is the iconic War Bonnet. Mounted proudly atop the front fender in a chrome frame, this light makes it clear, This is a genuine Indian Motorcycle®. VALENCED FENDERS Stylish, elegant and functional, the iconic valenced fenders, standard since 1940, enhance the flowing styling lines of every Indian Motorcycle®. They also provide protection, effectively blocking road spray and gravel kicked up by the tires. LACED WHEELS The Indian® Chief® Classic rolls on bright, high quality laced wheels. Forty stainless steel spokes make up the wheels, which evoke iconic, timeless Indian Motorcycle® style. CENTER CONSOLE Chief® Classic instrumentation combines modern technology and traditional style. The tank-mounted console has a large, easy-to-read analog speedometer as well as a digital display screen that provides a wealth of valuable ride and fuel data. All Indian pictures are kind of Indian HD motorcycles picture was taken, including motor fuel gauge, engine, engine mounts, tires, fuel tank, the car handles, lights and so on, 2015 Indian Chief Vintage Indian Red / Ivory Cream full-screen viewing,2015 Indian Motorcycles today Price: $21,799 .